Is that a ten-gallon hat, or are you just enjoying the show? 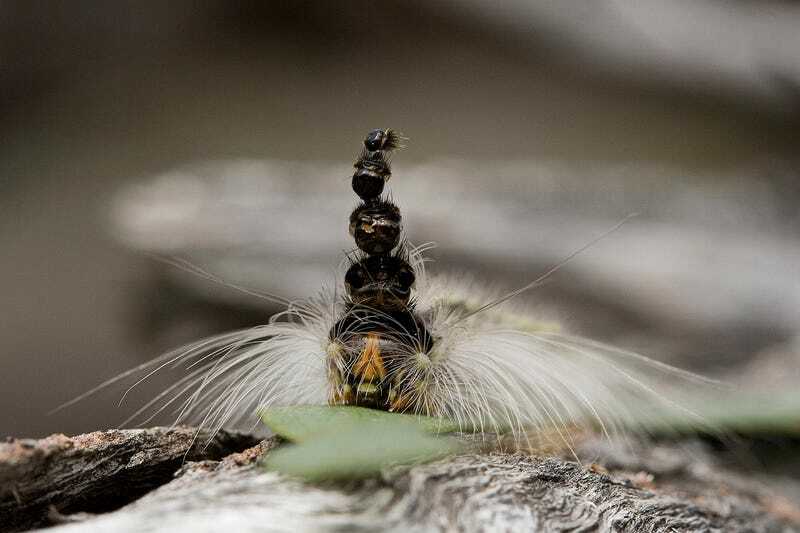 U. lugens caterpillars molt 11 times before forming a cocoon (most moth caterpillars only molt 4 or 5 times), and the caterpillars' bodies are covered in long, irritating spines that cause painful red welts on people unfortunate enough to touch them. But the most peculiar thing about U. lugens is what it does with its old exoskeletons after each molt. In fact, it keeps all its old heads. And wears them, stacked up on top of one another, like a gruesome totem-pole hat. Why does it do this? Nobody knows . . . and, in fact, despite being a well-known species, no researcher really seems to care all that much. U. lugens is a eucalypt-murdering pest . . . and now it has established a foothold in New Zealand, where it has no real natural predators. So most current research is less along the lines of "why does it wear a hat-of-ten-heads", and more "how can we murder as many of these things as possible?" Caterpillar photos © Nuytsia@Tas, used here without permission. "Caps for Sale" © Esphyr Slobodkina, whose hometown of Chelyabinsk, Russia was recently rocked by an exploding meteor.